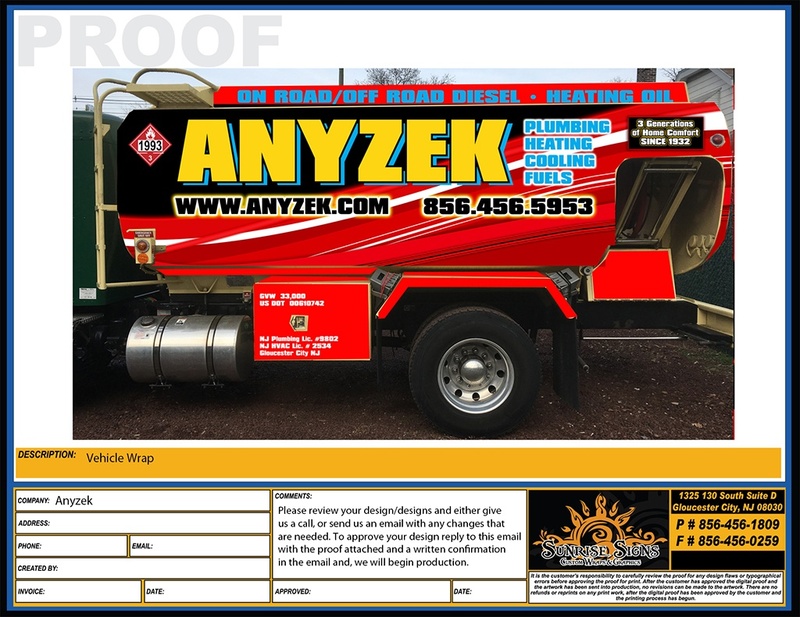 Anyzek Fuel reached out to us a few years ago looking for help rebranding their vehicle fleet - and we were more than happy to help! We worked with their existing vehicle branding to create a new, updated brand image that still incorporated elements from their previous design. Since then, we've wrapped a handful of their vans and delivery trucks and are always ready for what they can throw at us next. Which for this blog, happened to be a batch of oil tanker trucks! 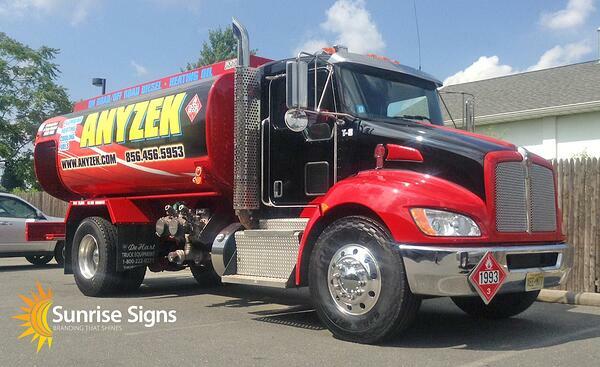 Anyzek Fuel came to us with four fuel tanker trucks that they wanted to update and wrap with their new branding. These vehicles had all been on the road and delivering fuel, so when it came time to get them rebranded, a little preparatory work had to be done first. Their owner got the truck cabs painted, along with the upper and lower parts of the tanker - pipes, grates, fenders, boxes, and other accessory pieces of the truck. They left the main showpiece, the tanker body, in our capable hands. To properly prepare the tanker, we removed the previous graphics, sanded trouble areas, and prepped the surface to get it ready for a vinyl wrap installation. What a difference a wrap makes! To draft the layout and design we started by taking photographs and detailed measurements of the tanker body, and then scaled these pieces to create an accurate template in which to work from. With this template created, we applied the Anyzek Fuel branding elements and made sure they were cleanly incorporated to the lines and curves of the tanker body. This installation used a combination of digitally printed graphics and cut vinyl lettering. 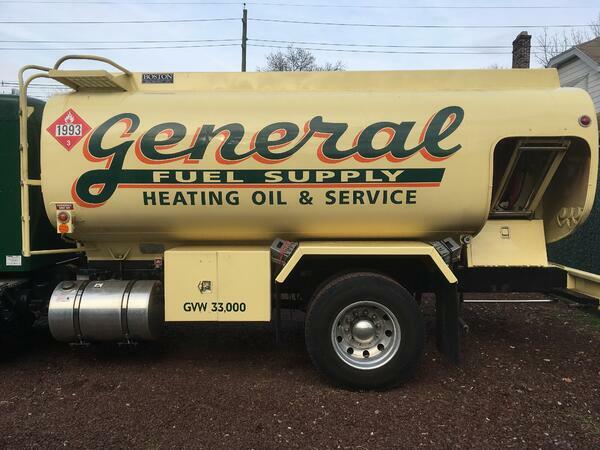 The main tanker body was fully wrapped, while we used vinyl lettering along the top bar and bottom boxes on the vehicle. Since the vehicle was previously painted, we didn't need to use unnecessary material on the tops and bottoms, saving the customer both time and money. That being said, we made sure to use specially printed vinyl for the cut lettering to ensure that it would match the colors of their previous vehicles and ensure brand consistency across the fleet. Clean, professional banding that can't be missed! 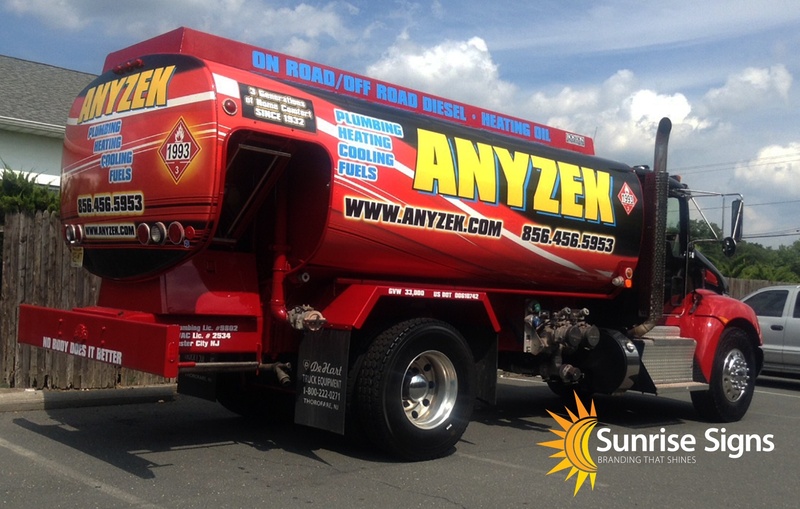 With four more tankers now wrapped and the previous fleet branding provided before, Anyzek Fuels can't be missed while they're driving around and servicing South Jersey. 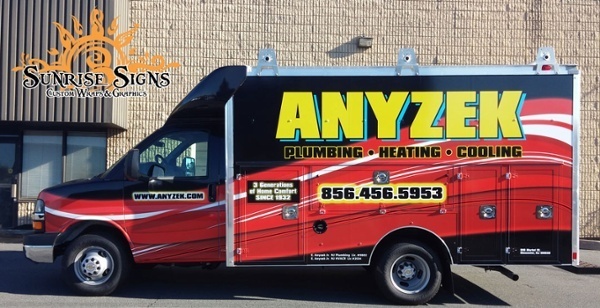 While they might have different styles of vehicles on the road, the consistent colors, branding, and layout of Anyzek's vehicle wraps means they'll provide the same brand retention and recall like any other fleet. Like what you see? Ready to step up your marketing and start branding your vehicle fleet? Give us a call and we'll find the best solution to get your vehicles branded and the best bang for your marketing buck!